Daylighting is the controlled admission of natural light into a building to reduce electric lighting and save energy. Daylight can enter a space through several architectural elements, including windows, skylights, roof monitors, and clerestories. Each of these elements creates a daylighting zone, which must be controlled with a daylighting responsive lighting control system in order to reduce lighting and save energy. Light fixtures within these zones can be dimmed or turned off to reduce energy consumption without negatively affecting the occupants of the space. The three daylighting zones are as follows: primary side-lighting, secondary side-lighting, and top-lighting. Primary and secondary side-lighting zones are illuminated by windows, while top-lighting zones are illuminated by skylights, roof monitors, and clerestories. Daylighting zone sizes and controls are determined by the code requirements of the local jurisdiction. ASHRAE 90.1-2010, The International Energy Conservation Code (IECC) 2006, IECC 2009, IECC 2012, and California Title 24 all have different requirements for daylighting, including the size of the daylighting zones as well as how these zones are to be controlled. IECC 2006 code does not require any type of daylighting controls. IECC 2009 and 2012 require all fixtures in the daylighting zone to be controlled separately. California’s Title 24 and ASHRAE 90.1-2010 require daylighting to be controlled automatically. Daylighting requirements for any project will depend on which code the local jurisdiction has adopted. Daylighting zones can be controlled 2 ways: manually or automatically. Manual controls can consist of a light switch, dimmer, contact, or lighting control panel. As long as the fixtures in the daylighting area are circuited separately from all other lighting and can be turned on/off or dimmed separately, manual control of the daylighting zone is acceptable for jurisdictions that have adopted IECC 2009 or 2012. Automatic controls consist of a photosensor, control unit, and switching or dimming controls. The photosensor is mounted to the wall, ceiling, or light fixture within the daylighting area and sends a signal to the control unit when the preset lighting threshold is reached. The control unit, which can be a dimmable ballast or a low voltage relay, receives the signal and issues a command to adjust the lighting appropriately. The switching or dimming controls receive the signal from the control unit and adjust the lighting levels in the daylighting zone by turning the lights on/off or by dimming the lights up/down. Daylighting uses the natural lighting that enters a building to replace some of the electric lighting installed in the space. This allows light fixtures near windows and skylights to be dimmed or turned off for a portion of the day without any light level loss within the space. Manual daylighting controls rely on a person to adjust the lighting when there is adequate daylight in the daylighting area, while automatic controls adjust the lighting as required throughout the day without any input from a person. 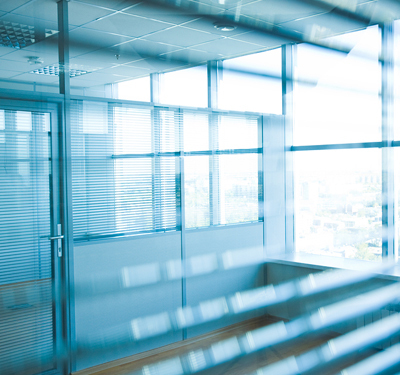 Manual daylighting controls are the least costly option, but require the occupants of the space to dedicate time to adjusting the lighting throughout the day. Automatic daylighting controls are more expensive, but are guaranteed to adjust the lighting appropriately without effort and can allow for a reduction in light fixtures and save energy and money throughout the year. Daylighting, when controlled properly, can adequately supplement interior lighting to reduce lighting energy consumption without any negative effects on the occupants of the space.